MICHELLE: I’ve already awarded my pick to The Girl from the Other Side a time or two, so though I’m definitely happy to read more, I should probably branch out a bit. There are several other titles I’m interested in this week, but I’ll award my official pick to That Blue Sky Feeling, which I admittedly haven’t read yet but which looks right up my street. 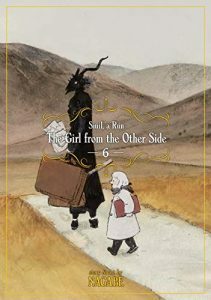 KATE: At the risk of being Manga Bookshelf’s most predictable member, I’m voting for the latest volume of The Girl From the Other Side. SEAN: Quite a few titles I’m interested in but nothing I’m devoted to, so I’ll go with the title I plan to read first, which is Fullmetal Alchemist: The Complete 4-panel Comics. I love Arakawa being silly. ASH: I’m curious about Candy Color Paradox and I really enjoyed the debut of That Blue Sky Feeling, but The Girl From the Other Side easily remains one of the best series that I’ve read so it gets my pick this week. ANNA: At the risk of being overly predictable, I’m going to pick The Girl From the Other Side too! MELINDA: And I’m going to be absolutely predictable and go for Fullmetal Alchemist: The Complete 4-panel Comics! Arakawa always wins with me, and her comic… uh, comics are a sublime treasure.